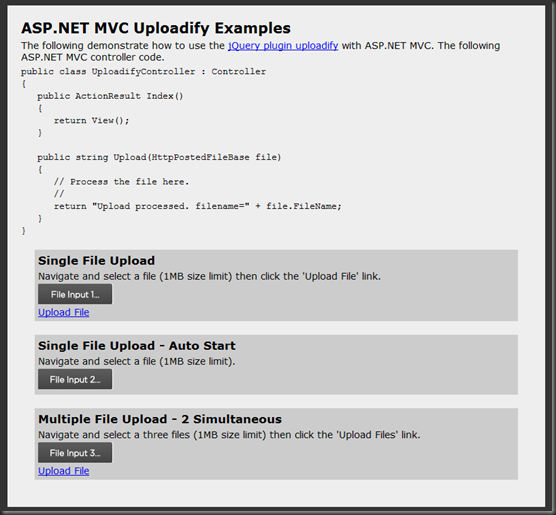 I recently posted an in depth tutorial on how to on upload multiple files using Uploadify. 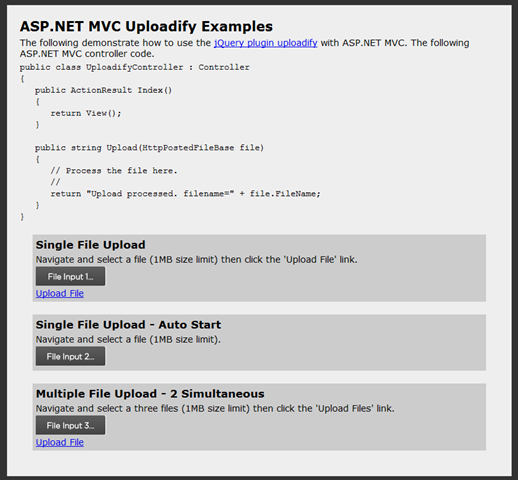 Uploadify is a jQuery plugin that allows the easy integration of a multiple (or single) file uploads on your website. It requires Flash and any backend development language. An array of options allow for full customization for advanced users, but basic implementation is so easy that even coding novices can do it. Uploadify is very easy to use. Here is a demo page. The controller code is very simple. // Process the file here. The CSS is minimal for this demo page. This is mostly a CSS reset to normalize the differences between browsers and then a couple of rules to set how the elements render. uploader – This option sets where the SWF file for the flash control is located. Because this is a path, you should use one of the MVC helpers. script – This is the action method that is called once the file is completely uploaded to the server. fileDataName – This is the parameter name that is passed into the action method. buttonText – This sets the text in the button. multi – Allows the control to be configured to handle multiple files. sizeLimit – The maximum number of bytes for each upload. simUploadLimit – The number of simultaneous uploads. If you are worried about multiple files uploading and calling your action method, set this to one. cancelImg – The image used for the cancel icon. auto – Automatically starts the upload if this value is true. onError – Callback if there is an error. onComplete – Callback on the completion of every file.